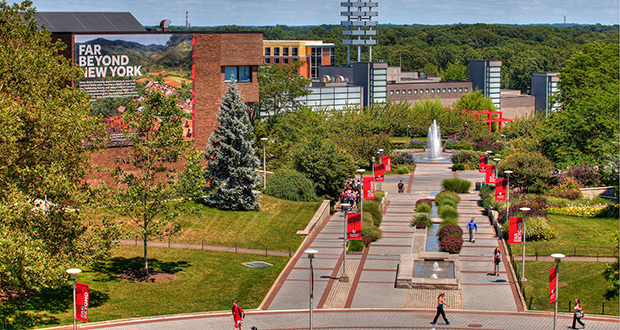 Jobs at Stony Brook University can be a great way to get socially involved on campus. There are a variety of jobs and opportunities for anyone with a specific skill. If you need an on-campus job, look no further, this list will include places near your dorm room that you can easily walk to and make some money. The library is usually jam packed with people and student assistants are typically the ones there to help. As an assistant you would help keep the space clean by permitting food and drinks near the computers, dusting off the computers, and walking around the area to let people know they can call you over if they need help. Are you interested in sports and working with cameras? A recently added paid position is assisting the Athletics department as a broadcast production assistant, videographer, and a PA announcer. This is definitely a hands-on position that can help blend your interests in working with athletics and the production side of a game. Working at the campus rec can help you stick to your gym goals as well as keep you socially active on campus. Depending on your task for the day, you’ll be interacting with many people throughout your shift. If you’re interested in becoming a fitness trainer, you can also do that. With two locations on campus, Starbucks is a popular location that’s usually filled with people waiting on their orders. If you enjoy a faster pace of work, you will always find something to keep you busy here! Plus you can always become people’s favorite baristas when you remember their orders after the fifth time. At the Student Activity Center there are always events going on and lots of people coming in and out. The staff at the SAC help at the help desk, setting up events in the auditorium, and help managers with other duties. If you want to get involved with these jobs, this is the perfect place for you to work! One of the newest campus dining locations is Subway. With five locations to hang out with friends while eating food, working at one of them definitely has its benefits. You’ll have the opportunity to get a free meal per shift and meet new people that you wouldn’t have met otherwise. It’s a great social job that can teach you practical skills as well as communication skills. If you enjoy working in a technical setting, being a computer lab monitor would be a great way for you to help people with computers. There are over ten computer labs spread out across campus that need students to oversee them. This gives you the chance to interact with new people every single shift and give other students the comfortability of coming in to do homework while getting any assistance they may need. Take notes with OneClass and get paid while you go to class. When you take Notes with OneClass, you not only earn but also get better at studying and focusing during your lectures. Become a Notetaker today. My name is Evelin and I'm doing a double major in Journalism and Spanish!